Twitter has just implemented a change that may well have a massive impact on the service. The company has revamped its highly controversial Suggested User List, in favor of a list of Suggestions based on topic. That’s big news in and of itself (before Twitter’s suggestions were not categorized), but there’s also apparently no way to add all of these users to your account at once. In other words, members of the SUL will likely see their user growth counts take a big hit. You can try out the new suggestions page for yourself here. We’ve created a number of algorithms to identify users across a variety of clusters who tweet actively and are engaged with their audiences. 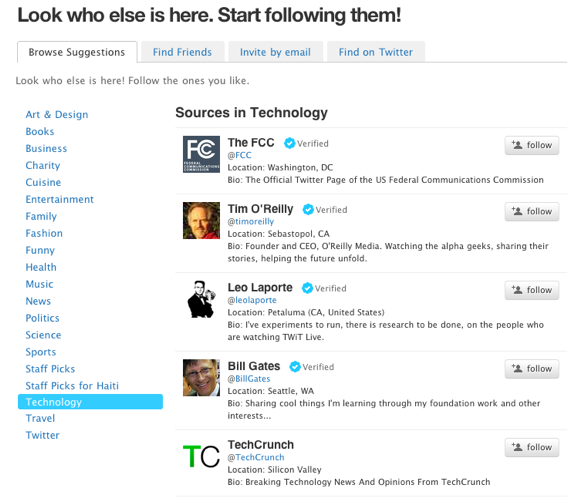 These new algorithms help us group these active users into lists of users by interests. Rather than suggesting a random set of 20 users for a new user to follow, now we let users browse into the areas they are interested in and choose who they want to follow from these lists. These lists will be refreshed frequently as the algorithms identify new users who should be suggested in these lists and some that are not as engaging to new users will be removed. We’re still playing around with the new suggestion feature, but here’s what we’ve gathered so far. First, it looks like members of the old SUL have been transitioned over to the new format. There are twenty categories, covering everything from Technology to Cuisine (there’s also sections for Staff Picks, as well as a spell list of Staff Picks for Haiti). Clicking on one of these categories will bring up 20 recommended Twitter users. It appears that the order of the users presented has some randomness to it — I’ve had the order of the Technology section switch a few times as I played around with it. The Suggested User List has long been controversial, because it effectively guarantees anyone on it hundreds of thousands of Twitter followers (disclosure: TechCrunch is on the list). But the list certainly has a valid purpose — it helps expose new users to interesting Twitter users (Twitter is pretty boring if you aren’t following anyone). The old SUL would present 20 people, at random, from Twitter’s list of possible recommendations. It also allowed users to follow all of these recommendations at once. The new system has apparently removed this mass-follow ability, which may well cause a downturn in the rate at which members of the list get new followers. Granted, it’s still pretty easy to hit those Follow buttons next to every suggested user, but it takes much more effort than adding them all in one fell swoop.